Do you walk to work? More importantly, could you walk to work even if you wanted to? Most of us nowadays find seldom opportunity to stretch our legs given our ever more chaotic lifestyles. Walking offers so many benefits not least the benefits to health. 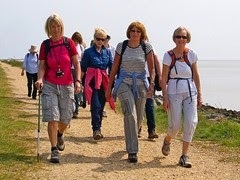 It is National Get Walking Week as promoted by www.ramblers.org.uk until 10 May 2014 and we are encouraged to get out and walk. As the recently departed Bob Hoskins famously said in a 90's advertisement campaign, ‘It’s good to talk’, and Ramblers could be well served in borrowing from that to say ‘It’s good to Walk’. But is it always? Could we all get by just walking? No doubt walking is something that most would agree needs to be encouraged but aside from rambling in the hills and brisk walks about town we seldom find much time to make walking a practical part of our daily lives. ‘Driving me lazy’, or just plain necessary? We’ve mentioned walking to work because, let’s face it, our longest, most important critical journeys of the day tend to be based around getting to and from work. For most of us to try doing that would be inconceivable. Walking to work simply wouldn’t be an option. The latest census, carried out in 2011 shows that out of 41,126,540 people 37.1% drive to work whilst a paltry 6.9% make the journey by foot. Taking into account the location of the Manchester offices of Geoffrey Miller Solicitors it is interesting to note that in the city of Manchester a lower figure of 25.1% drive to work compared to 8% who walk. Our London office can look to an even smaller figure of reference of 18.3% who drive to work and 5.8% who walk. Walking as a functional part of everyday life is clearly reflective of the surrounding circumstances of an individual. The location; the type of work; the distance of the commute; the transport infrastructure are all relevant to whether it is feasible to walk to places when we need to be somewhere. For the most part those of us who drive do so because we have to. This isn’t what the Ramblers Get Walking Week week is about of course. It’s about encouraging more people to walk when they get the opportunity to get some of the many benefits from doing so. Imagine if that isn’t a choice though. Imagine if you were forced to consider walking more places. Whether it be walking the whole journey or walking in between various forms of public transport it would put a lot of us in a lot of difficulty, not just for getting to work but as part of our jobs in some cases!